Just a couple of pics of my new roof top tent I picked up used so that camping in the rain and cold temps is a bit nicer (mainly for the gf). Kinda cool and it's such a low profile it seems to have little effect on gas mileage and makes little to no noise. Last edited by thewwkayaker; 05-02-2012 at 04:23 PM. OK I have no idea why this isn't showing up - if anyone wants to see the pictures let me know what I'm doing wrong getting pictures to embed. I'm using flickr to host, copied the url for each. Last edited by thewwkayaker; 05-02-2012 at 04:24 PM. Edit nvm... do you have your album set on private, maybe? Fixed it. Needed to use BBCode and not just the url it seems. That's cool. What's the fabric made of for the tent material? That's awesome. Usually see those on larger cars, so props for making the most of the Fit. Wow- nice! Now I can see why you were so dedicated in your research on the Thule rack mounting. You've got the tent sitting on two crossbars, not the three that you were thinking of earlier. Is it stable enough on the highway and stationary on just the two bars? Anyway, it looks great! I like it a lot. How much did it cost you? What's it like in there? Looks like a Full-sized bed, how big is it? Is it stable? Can it handle a good romp? It's amazingly stable. It's such low profile that it has little impact on the car or roof rack. I had more issues with my cargo box and bikes on the roof. 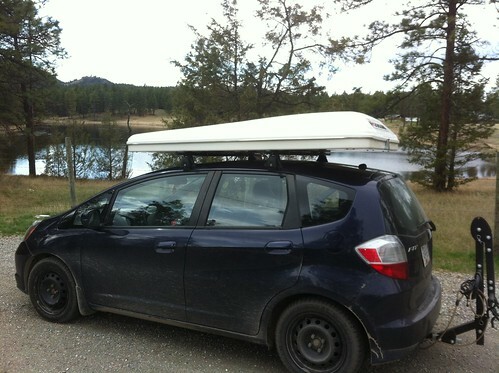 I drove the car with the tent from one end of BC to the other without any issues. Size is 51x83x36" open. Closed the last dimension is 12" although I think that's average. It's 119lbs (this is all from the manufacturing website specs). Contains the foam bedding, pillows and ladder. I'll throw a quilt on top of the bed. Rack can take a load of 125lbs (dynamic weight) so it's within spec although because of it's low profile it has far less pressure on it than other options. It takes about 30s - 1min to open and a couple of minutes to close back up. So after you open it up, grab the ladder and extend the ladder and hook it onto the side and climb up you can then just get under the covers and go to bed. Uses a crank with worm gears and scissor arms to open/close. Waterproof, 2 doors and 2 windows. Bought it used - it's expensive. New (US price) is $2500 I paid $1500CAN. Barely used in perfect condition. My model is the Maggiolina Airland. There are a couple of models. I use to pull a Boler (great trailer although they are getting more expensive despite getting older - built between 1968-1980) but that's too much for the Fit (900lbs). Used originally (mainly) in Africa and similar places on SUV's. I picked it up because I travel a lot to play and often find myself between places to camp (lots of long road trips). Years ago I got fed up with regular iceboxes (changing ice, everything floating around esp. meat juices, things getting too warm when ice ran down, leaking from box) and picked up an Engel portable fridge which is also used in the outback. It's amazing - 0.7-2.7Ah on 12V and can make blocks of ice in 40C weather! Full compressor, heavy but lasts forever. So now I'm looking for a deepcycle battery for the Fit (I read a few threads on the matter). I might still go with Optima Yellow Top as it did work well on my old Xterra. Only downside is I can't carry my white water kayak when I take the roof tent. AWESOME! Is the Fits Roof strong enough? (sounds dumb) But I thought the roof is a bit fragile . Haha that is super awesome! cant wait for pics! That is pretty awesome indeed. Is this, like, a product you can buy? I know this is late, but this is my first summer with my Fit. Where does the ladder go at night? Does it stay outside, attached to the tent? Seems like that would be an invitation for a visitor. I use to have a small pick-up that I owned a soft canopy, that could be set up quickly. I loved it for camping. I think that's a neat product, but my only concerns are pretty big. At my age? Climbing up and down the ladder could be problematic. It's really neat, but basically just becomes an "instant" tent. I don't know if a multiple thousand dollar investment into that reality is worth it. 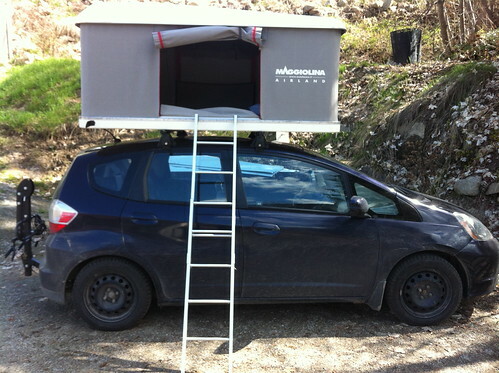 Especially with the Fit, I'm not sure it wouldn't be better to use the roof for something else....and simply buy and use a tent. Did i misread? Do you and your gf weigh in at 3lbs each? Is this 125lbs that the rack can handle a moving max load? Or is that an all around max load? I feel like I'm missing something to make this math work. Please help.